« Is Cesar Millan God? A dire wolf skeleton discoverd in Gilmer County, West Virginia, proves that the species lived as recently as 300 years ago. This finding will rewrite the natural history of wolves in North America. A few weeks ago, I received a heads up about a discovery that happened just a few miles from where I grew up. Indeed, this discovery happened not too far from my great great grandparents’ homestead on Lower Run, which is just near the line between Calhoun and Gilmer Counties in West Virginia. This discovery happened last August. It is only now that the full results have been released to the public. The exact location has not been revealed. It seems that a member of a local hunt club, who shall remain anonymous, was exploring a cave that is known for having lots of Indian arrowheads on the cave floor. Over the years, most of the arrowheads have been taken out. This individual was checking out the far reaches of this cave when he came across some bones. After shining his flashlight over them, he discovered that they were of some sort of large dog. Indeed, he thought they might belong to a St. Bernard that had run away a few years ago. However, there was no hair around the skeleton. The only thing left was the bones. He called the DNR to report the find. Then the US Geological Survey got involved. It turns out that the skull for this skeleton was not at all like that of a St. Bernard. It was obviously that of a wolf. And a very robust one at that. It had much larger teeth than any known gray wolf population. Indeed, its anatomy most closely resembled the dire wolves that were taken out of the La Brea tar pits. However, there was one problem with these remains being those of a dire wolf. They were radiocarbon dated to the mid-seventeenth century to the early eighteenth century. Europeans had not yet penetrated beyond the Blue Ridge when this wolf had died. However, its remains are far more recent than any dire wolf skeleton yet discovered. This finding means that dire wolves lived during the modern era. There are so many descriptions of giant wolves on the North American frontier. Perhaps that is why we have legends like the Shunka Warakin, the Waheela, and the giant Ontario white wolf. Maybe they were actually dire wolves. Olsen says the reason why no other recent dire wolves have been discovered is that the wolves probably were not that common. Why the dire wolf went extinct without any mention without any historical mention of them is a good question. Olsen also speculates that canine disease could have wiped out the wolf population before Europeans settled this part of West Virginia. The dire wolf skeleton is being searched for possible DNA samples. The exact position of the dire wolf in genus Canis is not entirely clear. 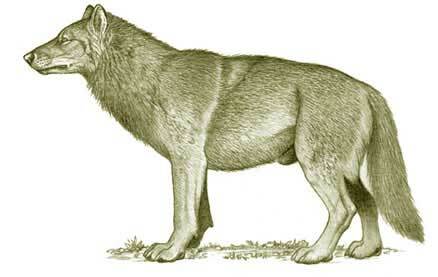 However, we do know that Canis dirus was still around as recently as 300 years ago. And that is a truly remarkable find. These dire wolf remains are going to rewrite the story of Canis on the North American continent. I wonder if any other remains from recent dire wolves are going to be found. I think that it is likely, but it also likely that dire wolf remains have been misidentified as those of unusually robust gray wolf specimens. Maybe the museum collections have some other remains that haven’t been identified as dire wolves. The story of wolves in North America needs to be rewritten. Update: Do not write a comment without reading this. Now thats really cool info. That is really freaking amazing! You’ve made me simultaneously very, very happy, and very, very sad by sharing this piece of news. This is beyond amazing! I’m glad the hunter actually decided to report this find. People around here are very reluctant to report things like this, especially if it was found on private land and just looked like a dog skeleton. I wonder how many other finds like this are collected dust in people’s attics and barn lofts? Hah. I just reread this properly (first was a quick skim over morning coffee) and I’ve realized it’s a hoax. The bit about “Eastern bison” is what gave it away for me. I’m crushed. I was getting ready to do some bone hunting this weekend in search of Dragons based off of this post. And now this.